The Welsh three-piece go back to their former band-mate’s lyric book and set it to music –- and reinvigorate themselves in the process. Most artists spend their careers attempting to move away from their early work, refusing to look back or take inspiration from their past. Why? Is it embarrassment they feel when confronted with their younger selves? Determination to continuously improve on what’s gone before? Or is it the worry that, should they return to any previous incarnation, they’ll invite unwanted comparison with a time when they were, perhaps, better? 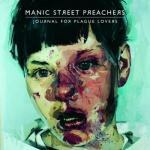 The Manic Street Preachers have certainly invited comparison with their early years with Journal for Plague Lovers. It’s their ninth album since their 1992 debut, Generation Terrorists. And it’s their sixth since the disappearance of guitarist, figurehead, and principle lyricist Richie Edwards, a man who not only brought glamour, direction and notoriety to the Manics, but also suffered bouts of severe depression, anorexia, and alcoholism. Shortly before Edwards’ disappearance, the Manics had released their third album The Holy Bible, seen by many to be their magnum opus. Critically-lauded, The Holy Bible was a dark, intense, sometimes claustrophobic listen, the sound of Edwards’ state of mind approaching meltdown. What followed was the band coming to terms with being a three-piece, continuing despite the glaring gap left by their former band-mate. Everything Must Go (1966) (and even more-so, 1998’s This Is My Truth, Tell Me Yours) was a soaring, string-drenched rock album that made them huge stars in the UK. They’d left their Clash-meets-Guns N’ Roses roots behind, it seemed -- and despite now-principle lyricist Nicky Wire penning plenty of poetic, nihilistic words, the creative high-point they’d enjoyed with Edwards was evidently behind them. However, in a complete U-turn of their career path, in 2007 the Manics released Send Away the Tigers -- an album that harkened back to their glory days of the previous decade. It’s led the way for Journal for Plague Lovers which, for the first time in 13 years, is a new Manic Street Preachers album that utilizes unused lyrics written by Edwards. Journal for Plague Lovers has been billed as the true follow-up to of The Holy Bible. In a lot of ways it can never match up to that album’s sheer power and dark intensity. This was, remember, an album that had a song called "The Intense Humming of Evil". What Journal for Plague Lovers is, if anything, is The Holy Bible if it had been made when the band were on the wrong side of 40. But the use of Edwards’ words brings back an edge, an edge that now-principle lyricist Wire couldn’t emulate alone. On occasion it sounds not too dissimilar to 1993’s Gold Against the Soul, which was panned over the years for its FM-rock leanings, an attempt to win over an American audience. Here, it balances out the heavier, darker moments. In the same way, though, there’re moments on the album that we could liken to what’s now known as the "Modern-day Manics": strings, lush harmonies, and more conventionally-structured choruses. "This Joke Sport Severed" is the most effective in this sense, thanks to a simple acoustic intro and yearning strings. "Facing Page: Top Left" works in a similar fashion, coming on like a more understated "Small Black Flowers That Grow in the Sky". And then there’s the sublime "Jackie Collins Existential Question Time." If there were to any singles released off this album -- which there aren’t, interestingly -- this’d be a strong contender. But thanks to producer Steve Albini, much of the album though is refreshingly raw (see opener "Peeled Apples"). But although Richie’s words are -- for the most part -- as clever and well-constructed as ever, it’s the music that’s less dark this time round. There’s a number of tracks here that wouldn’t sound completely out-of-place on 2001’s Know Your Enemy. It’s actually the final, hidden track, "Bag Lady", that sounds most like it could’ve been lifted off The Holy Bible. It’s a shame it’s been relegated to a hidden track, but it shows the band weren’t aiming to replicate the sound of The Holy Bible regardless of the quality of the music. So while Journal for Plague Lovers doesn’t quite match up to The Holy Bible, essentially it doesn’t need to. The Manic Street Preachers have come along way since 1994, but had this been their next album, chances are they still would’ve continued their upward trajectory. "It’s a fucked-up life, sunshine," James Dean Bradfield sings on "All Is Vanity". Broadly speaking, that’s exactly what the Manics have been saying since 1991 -- only never this explicitly. It’s taken the return of the words of their former band-mate, missing for 14 years, to emphasize this. And it makes Journal for Plague Lovers an essential listen.